Mastermind of the Sept. 11, 2001 attacks and four co-defendants defiantly disrupt an arraignment at the U.S. base at Guantanamo Bay. The self-proclaimed mastermind of the Sept. 11, 2001 attacks and four co-defendants defiantly disrupted an arraignment at the U.S. base at Guantanamo Bay on Saturday night. 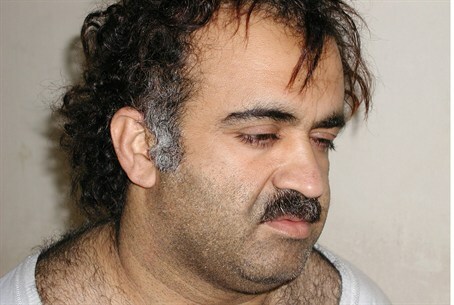 According to a report by The Associated Press, Khalid Sheikh Mohammed, the admitted 9/11 architect, and the four men accused of aiding the 9/11 conspiracy, knelt in prayer, ignored the judge and wouldn't listen to Arabic translations as they confronted nearly 3,000 counts of murder. It wasn't until more than seven hours into the hearing that prosecutors at the U.S. military base in Cuba began reading the charges against the men, which include 2,976 counts of murder and terrorism in the 2001 attacks that sent hijacked jetliners into New York's World Trade Center and the Pentagon. The report said that the five put off their pleas until a later date. Another hearing was set for June 12. Earlier, Mohammed reportedly cast off his earphones providing Arabic translations of the proceeding and refused to answer Army Col. James Pohl's questions or acknowledge he understood them. All five men refused to participate in the hearing; two passed around a copy of The Economist magazine and leafed through the articles, AP reported. Walid bin Attash was confined to a restraint chair when he came into court, released only after he promised to behave. Ramzi Binalshibh began praying alongside his defense table, followed by Ali Abd al-Aziz Ali, in the middle of the hearing; Binalshibh then launched into a tirade in which he compared a prison official to former Libyan leader Muammar Qaddafi and declared that he was in danger. “Maybe they will kill me and say I committed suicide,” he said in a mix of Arabic and broken English, according to AP. The detainees' lawyers spent hours questioning the judge about his qualifications to hear the case and suggested their clients were being mistreated at the hearing. The Obama administration renewed plans to try the men at the U.S. base at Guantanamo Bay after a bid to try them in New York City, blocks from the trade center site, faced political opposition. Mohammed, a Pakistani citizen who grew up in Kuwait and attended college in Greensboro, North Carolina, has admitted to military authorities that he was responsible for the Sept. 11 attacks as well as about 30 other plots. He has also admitted that he personally killed Wall Street Journal reporter Daniel Pearl. Mohammed was captured in 2003 in Pakistan. Binalshibh was allegedly chosen to be a hijacker but couldn't get a U.S. visa and ended up providing assistance such as finding flight schools. Bin Attash, from Yemen, allegedly ran an Al-Qaeda training camp in Afghanistan and researched flight simulators and timetables. Mustafa Ahmad al-Hawsawi is a Saudi accused of helping the hijackers with money, Western clothing, traveler's checks and credit cards. Al-Aziz Ali, a Pakistani national and nephew of Mohammed, allegedly provided money to the hijackers.